The ALZO Screw Mount to Ceiling Background Support kit is an inexpensive and convenient solution for hanging photo backgrounds in an office or any room that has a flat ceiling. 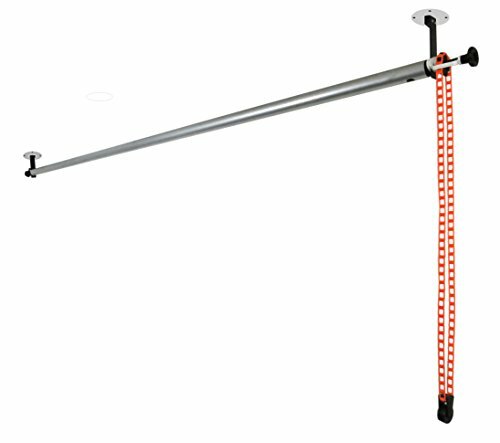 This background support system includes 8 toggle bolts for secure attachment to a drywall ceiling and provides a chain drive to roll down paper or muslin backdrops, up to 10 feet wide. We also offer a custom cut service that will provide any length from 6 feet up to 13 feet wide. The custom cut cost is $50. With the exception of 6 feet, custom cut drop ceiling background supports are not returnable. Please call 800-582-7009 to discuss this service. The sturdy 2-inch diameter aluminum tubing assures that a paper background will remain straight and does not warp after months or years. The kit includes 2 hooks with round screw plates, 1 aluminum pole 10 feet long and 2 inches in diameter, 1 two-piece roller set with chain and weight, and detailed American-written installation instructions. This product carries a 5-year warranty.